Your wedding celebration is one of those days that will remain in your memory forever – and dishes that are served during the reception are often second most important part of the event, right after the newly-weds. Before committing to any catering company, be sure you are content with what their answers to these questions are. What types of services are included in your catering contract? To avoid an extra expense, you have not accounted for in your budget planning, make sure you know exactly what’s included in your quote. What services are you paying for, besides the obvious – delicious and mouth-watering food? The overall experience of your wedding guests will also depend on smaller things like tray-passed finger food, wine and champagne pouring service. Some event catering companies will include service ware, napkins and cutlery hire within their estimates, some may not – and these aspects of the party might not necessary pop into mind immediately, but are crucial for the success of your reception. Alternatively, these – by some suppliers considered additional – options can be provided by a wedding hall you hire for the event itself. Prior to your meeting with a potential caterer, prepare a well-thought break-down list of all services you imagine having at the wedding. Being upfront with yourself about the budget you can afford is utmost important to save you precious time and disappointment – many couples enquire for services at catering companies that would never fit their budget and are later heavy-hearted about not being able to book their perfect supplier. What services only come with an additional fee? There is a string of wedding catering services that come only with an extra price tag attached, e.g. corkage fee if you are providing outside cocktails and alcohol, or a cake cutting fee when your wedding cake is baked by another supplier. Comparing event catering packages is also much easier if you are aware of all the services that are included in the price (and whether you do want them; or they are going to only be an additional cost, although seemingly delivered “for free”). This helps to make sure you are getting your money’s worth. Try to make the caterer responsible for providing you with a broken-down estimate of your total expense. If the base fee consists of “per head” rates, you need to find out what type of service is included in the “per person” charge. It may turn out the only two things included are food and drinks for one guests, and all the other services are playable extra. Avoid unexpected additions to your final bill by asking whether labour, load in/out, waiting staff and bartenders’ wages are encompassed in the per person fee. If any aspect of the catering contracts is unclear, enquire at the catering’s team – their representative should be able to explain what’s what, and lay out all deadlines for you. Take notes where the first deposit is due, what is the deadline for final guest count, and what are the caterer’s charges for last call changes. Have their staff worked at your wedding venue before? A caterer that has previous experience working at your venue will know the standard procedures of the venue, policies and load in/out timing, floor plans and simply – where stuff goes. Your party will have the full attention of the waiters, rather them fiddling around trying to find their way around the building. Where do they source their ingredients from? Nothing is a better representation of a caterer’s adjustability than their sources of food ingredients. 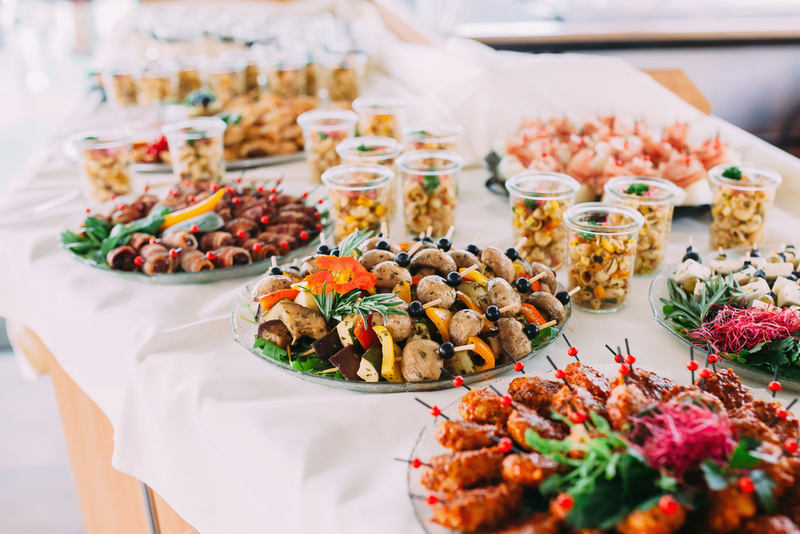 Food service providers that head to local markets and use fresh seasonal ingredients are more likely to work around their standard wedding menu packages to prepare a bespoke catering options specifically for your reception. You are then less likely to have a hard time persuading the company to adjust to your preferences and accommodate special diets.